I haven’t understood the problem correctly. If the series in the coloumn B is to be repeated in col C with an increment of 2, one could enter in cell C2=B2+2 and drag cell C2 down. Then in Col C the numbers will appear as 3, 5, 7 etc. 1. At a cell in the Contents page Right click and select hyperlink. It would lead to a window. 3. In the other cell appearing in the window type how you want that reference to appear say Bombay population 2011 and press OK.
4. Make sure that the name entered in 2 above should be exactly the same with spacing etc. To ensure this one can copy the title from the sheet and paste in step 2. Thank you for your tip, it is very useful. I’m afraid I didn’t do a good job in explaining the problem. The problem is not that the number has to be incremented by 2. 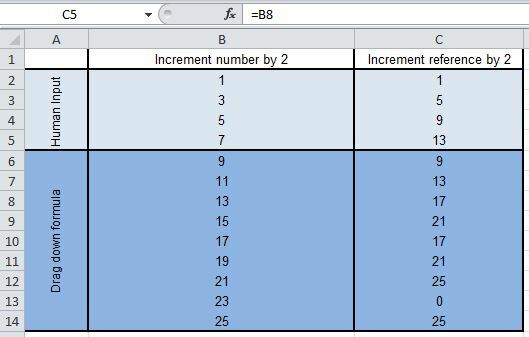 The problem is that the reference cell has to be incremented by 2. So, I need the values of B2, B4, B6 in cells C1, C2, and C3 respectively. Elegant solution to a nagging problem, thank you. This just saved me a whole bunch of time!